A seamless fit ... the walls to the heels to the bars. They're all connected and all have a unique assignment as to support of the horse during weight loading. The heels and back structure of the hoof are the most important, as we've talked about. The bars are included in the hoof wall material that grows from the bottom of the lateral cartilages as "heel buttress". It is MOST important that when looking at the hoof one does not think of the hoof as a static object standing on a firm, concrete surface but one that is malleable and dynamically affected by the terrain on which the horse lives and moves. 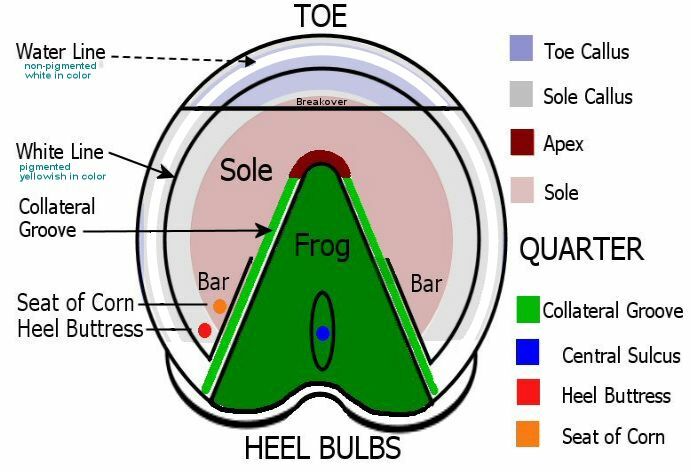 Simple introduction -- the bars start at the heel buttress and then taper down to blend in with the sole about the 1/2 mark of the frog. What are the roles the bars play in the equine foot? First of all, they provide a verticle stop for expansion of the hoof. This means SUPPORT for the hoof as it is loaded. They, along with the heels, prevent the hoof from expanding excessively as the foot is loaded and keep the foot from excessive verticle downward pressure. This is coupled with the lateral cartilages role in vertical descent of the foot. Secondly, the bars provide traction -- coupled with the heels as we talked about in the last post. Thirdly, they act as 'skid brakes' ... they dig in to the ground as the hoof is loaded and help stop the forward motion of the hoof and horse. Excessive trimming of the bars (and heels) will cause the hoof to descend and expand further than what the hoof is designed to do and cause the sole to thin as well as possibly foundering the horse. So, how MUCH to trim the bars? That is a matter of great controversy. In my horses' world, "less is more" when it comes to trimming the bars. It is important to listen to the individual hooves, as I've mentioned before. What do I mean by 'listen'? OBSERVE ... watch what happens to the hoof after a trim. Does it immediately grow back material that has been trimmed away in just a matter of a couple of weeks? Or even less? Then that tells you that the hoof NEEDS that material. So, if you trim down the bars and in 2 weeks or so you see they've grown back then that hoof is telling you it NEEDS the bars to be the grown-in height. What do you see? Do you see protruding bars? Obviously the hoof NEEDS those bars for the horse to be comfortably mobile in the wild! They are far from being what many have been taught to be "perfect" bars! They look ragged and overgrown and some would say MUST be causing the horse pain and the bars to be 'impacted'. Not so. Pamela Nickoles describes the hoof to be "A Perfectly Designed Wild Horse Hoof"
And, I agree. Nature knows best. This shows an Australian Brumby hoof, photo by Jeremy Ford as shown in an article by Pete Ramey. What do you see? Do you see protruding bars? Nope. We see seamlessly blended bar with the heels and sole. In this case the mare was gimpy to start but 100% sound after her trim. Listen to the hoof -- observe -- if your bars are growing back on your horse's hooves in warp time then stop trying to take the bars away! The hoof NEEDS them for support. If you have questions about your horses' hooves you can always reach me by email. gwen.santagate@gmail.com I'd love to chat with you a bit.